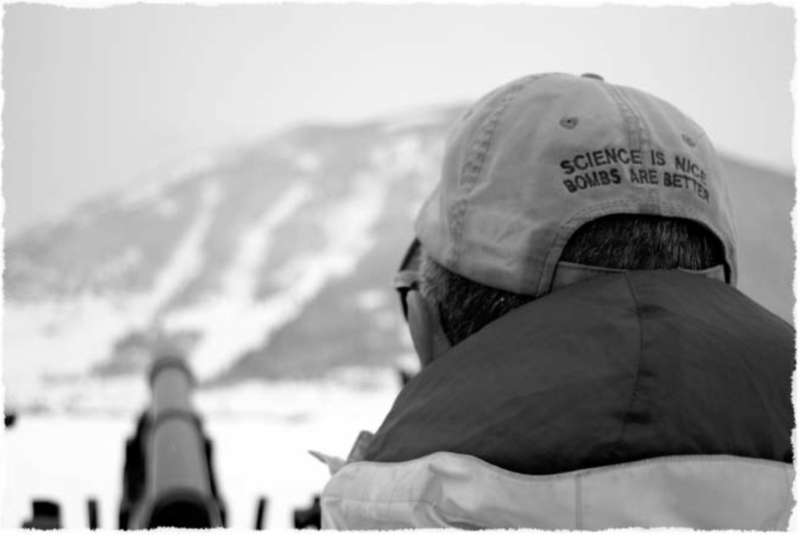 This story by Jonathan P. Thompson ran in the Silverton Mountain Journal in winter of 2002. Given the historic avalanche cycle, and the lengthy closure of Red Mountain Pass, it seemed like an opportune time to re-up it. Spoiler: Silverton has been shut off from the world by avalanches many times in the past. In 1932, the roads and railroad were shut down from February until the end of April. Yikes! Eddie Imel died 10 years ago this March (editor’s note: in March 1992). Imel was a plow driver for the Colorado Department of Transportation on the Ouray side of Red Mountain Pass. Like all the plow drivers between Ouray and Cascade, Imel was part of the infantry; he was a foot soldier in the war to keep Highway 550 into Silverton open and keep the town it feeds alive. Imel was the third soldier to die in that war in 22 years and, like the other two, he was slain by the deadliest enemy of this unending conflict: the East Riverside Slide. The winter of 1991-1992 was not an especially heavy one in these parts. In fact, after a good start–43″ of snow fell in Silverton in November–the snowfall petered out. December (15″), January (10″), and February (15″) were all unusually dry months for snow in the San Juans. Long periods of sunny days and cold, clear nights between storms served to rot out the early, scant snowpack. In other words, conditions were ripe for a serious avalanche season upon the arrival of the big, spring storms. And arrive they did: Over 30 inches of snow fell in the San Juan Mountains and the slides were running all over the place. Highway 550 was finally closed, but by the time the gates were shut, it was too late. The CDOT truck that swept the road to make sure all motorists were out of danger dodged big slides before being blocked by a portion of the East Riverside Slide that had hit the road just north of the snowshed. Edie Imel and Danny Jaramillo were piloting a CDOT plow, attempting to clear the road so that the sweep truck and other motorists inside the snowshed could get to safety. The plow came to a stop, the two soldiers got out to adjust the chains, and, as the East Riverside is apt to do, it ran again, burying the plow and the drivers. Everyone in the snowshed, CDOT officials, and local law enforcement reasonably assumed both victims of the slide were dead. A body recovery effort would have been too risky, so it was delayed. The motorists in the shed were escorted back to safety, the mourning began, and, 18 hours after the slide ran, a call came in from the emergency telephone in the snowshed. Danny Jaramillo had tunneled his way out of the cement-like snow. Imel’s body was recovered not long after. The system, or rather the lack of a real system, for determining avalanche hazard and deciding when to close the road had failed one too many times. Things had to change. Silverton’s connection with the outside world has always been vulnerable to snowslides. Before there were plow drivers risking their lives to keep the arteries and veins of San Juan civilization from being blocked, there were mail carriers. Before the railroad arrived in 1882, Silverton’s winter link to the lowlands usually consisted of no more than one man on a set of “snowshoes,” or long, wide, heavy wooden skis. Men with names like Greenhalgh, Aspaas, Bales, Mears, and Nelson skied regularly over Cunningham Pass (south of Stony Pass) with huge, 50- to 60-pound sacks on their backs or dragging sleds full of mail and supplies. It was not a job for the faint at heart — avalanche danger was ignored, at least one froze to death, and others, somehow, survived both snow and cold — but it was a necessary one. Without their efforts, Silverton would have had to shut down come winter. Newspaper clipping from March 1906, after a huge storm resulted in a deadly St. Patrick’s Day avalanche cycle. In 1882, the railroad finally reached the heart of the San Juans, but by no means did this signal an end to avalanche troubles. The snowshoe-riding mail carriers of old, as long as they avoided being hit by slides, could simply ski over the top of the slide debris, but the train could not. From Needleton to Silverton, the tracks pass through the depository for dozens of slides, some of significant size. Dramatic photos of the Saguache slide (probably also known as the Snowshed slide north of Elk Park) show a trench dug for the train through a 60 foot pile of snow and debris. Nearly every winter saw at least one avalanche-caused blockade during which the train could not reach Silverton. Sometimes they only lasted a few hours while tens or even hundreds of men cleared the tracks. But there were times when Silverton was cut off from the world for days, weeks, and, in one case, three months. In 1884, Silverton was without a train for 73 days. Food ran short and milk cows were killed for beef. The winter of 1906 will long be remembered as the most tragic, avalanche-wise, in the San Juans. Big January storms pounded the region following a relatively dry November and December, and the slides came down. Five men were killed at the mouth of the tunnel of the Sunnyside Mine near Eureka when they were engulfed by a slide. Eleven avalanches were reported between Silverton and Elk Park that ranged from seven to 30 feet deep and 50 to 450 feet long; the train was kept at bay for 18 days. All of that was minor compared to what followed in March when an enormous storm sat over the region for about a week, relentlessly pounding the San Juans. Slides swept away the Shenandoah boarding house, killing twelve men, and ravaged a number of other structures in the area, often killing their inhabitants and making that the most deadly avalanche season ever in the San Juans. Twenty-four people lost their lives to snowslides in San Juan County that winter. Transportation in and out of Silverton came to a standstill. Two-hundred men of Japanese descent worked to clear 50-foot deep piles of debris that at least 15 slides had deposited on the tracks between Needleton and Elk Park. It took 33 days for them to break through. Local newspaper editors blamed the Railroad, not the snowslides, for the delay in opening the tracks, a sentiment that would echo throughout the years, even after the highway became the main link between Silverton and everywhere else. Silverton continued that year to be pummeled by storm after storm. In February, following a devastating “San Juaner,” all highways were closed, including those to Howardsville and Gladstone; a slide wrecked the Iowa-Tiger boarding house at Silver Lake; all telephone lines in and out of Silverton were down; and the train crashed near Rockwood while attempting to reach Silverton. One couple hiked out to Ouray in order to escape the confines of Baker’s Park, some snowshoed to Rockwood in order to catch the train, and a 350-pound load of butter, eggs, and meat was brought by toboggan from Ouray. In April, it was reported that the Riverside Slide had deposited a pile of snow 300 feet long and 60 feet deep. The road to Durango (which at that time traveled down avalanche-riddled Lime Creek, not over Coal Bank Pass) was opened on April 30, and the Ouray side was cleared shortly thereafter. Only four years later Silverton was shut off again by slides for weeks, prompting a team made up of Louis Dalla, E.F. Sutherland, James Baudino, John Turner, and Carl Larson to snowshoe down the canyon to Needleton to fetch the mail. By the time one of the biggest winters in San Juan history hit in 1951, the railroad’s importance had been diminished somewhat by the improved highways, especially to the south. But in the San Juans even good highways, which traveled through slightly less avalanche-prone areas, are liable to be shut down, and that’s exactly what happened that year. There was so much snow that people had trouble getting around town, not to mention over the passes. The Highland Mary Mill in Cunningham Gulch was wrecked by a slide, killing one. The highway to the north opened after six days, and it took several more days of around-the-clock effort, to break through the dozens of slides that covered the road to the south. In spite of the huge winters, the series of avalanches that hit the roads with regularity, and the lack of any avalanche policy governing Highway 550 at the time, not one motorist had been killed by an avalanche on the highway by the middle of the 20th century. Nevertheless, following the huge winter of 1952, the Colorado Highway Department implemented an official policy dealing with road closures and avalanche hazard. The policy said that if avalanche danger was determined to be high, the road would be closed, control work would be done, the debris would be cleared, and the road re-opened. In other words, it was up to the motorist, not the highway department, to ultimately assess the danger and make the decision about whether to travel the road or not. It is a noble sentiment, and one from another time before liability and lawsuits were the norm. Up until 1991, the only avalanche forecasters were the plow drivers themselves, their command centers the cabs of their plows. The policy was imperfect, at best and, in 1963, its fatal flaws were first revealed. On March 3, 1963, Reverend Marvin Hudson made his usual trip over Red Mountain Pass to preside over services at the Silverton Congregational Church. He had his daughters Amelia and Pauline in the car with him. A large storm had hit and the East Riverside Slide had already run once. His car was slip-sliding across the road as he passed under the ominous East Riverside slide, so the Reverend stopped to install his chains. That is when the Riverside ran again. It took rescuers a week to find the Reverend’s body and another to find Amelia’s. Pauline was not recovered until May 30. 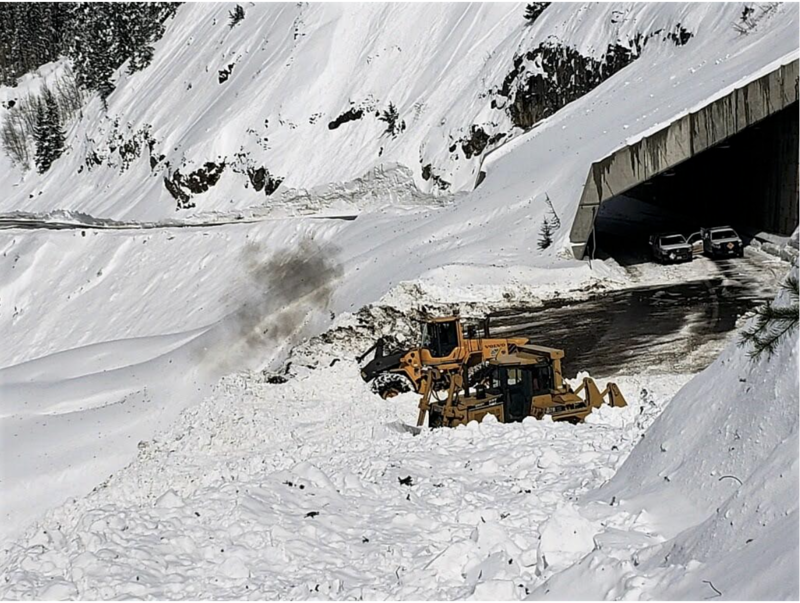 The tragedy inspired a Colorado Highway Department Engineer to recommend the construction of a snowshed under the Riverside, a suggestion made by a Swiss avalanche expert two years earlier. The shed was not built, the road closure policy remained the same, and, in 1970, plow driver Robert Miller was killed by the Riverside’s infamous second release. Angered citizens demanded the construction of a snowshed but Highway 550, which is still one of the last places to get funding from the state transportation coffers, would get no protection. Nothing was done. It took yet another fatality, under similar circumstances, to motivate the state to finally build the snowshed. This time it was plow driver Terry Kishbaugh who was taken by the East Riverside on February 10, 1978. Seven years later, the snowshed was built. At least one expert recommended the snowshed be 1,200 feet long; others said that the absolute minimum length for it to be effective was 400 feet. When all was said and done, the snowshed only covered 180 feet of highway (as it does today), leaving cars, and plow drivers, and Eddie Imel and Danny Jaramillo exposed to the deadly torrent known as the East Riverside slide. Those were the fatalities. Then there were the close calls. According to CDOT statistics, 68 cars were hit by slides between 1951 and 1991 between Coal Bank and Ouray. These included a Trailways bus that was knocked off Molas Pass by the Champion slide and a bus bashed by the Brooklyns filled with miners coming home to Silverton from their shift at the Idarado Mine. Injuries were relatively minor. Finally, when the San Juans had to say goodbye to a third plow driver in 22 years, things changed. In July 1992, CDOT announced its new Highway 550 Avalanche Hazard Reduction Plan. Weather and snowpack evaluation stations would be installed under the plan; avalanche control equipment such as Howitzers would be implemented; CDOT workers would all be trained in avalanche awareness; and fixed control-gun towers would be installed. Most significantly, however, the avalanche forecasting job would go to two Colorado Avalanche Information Center professionals based in Silverton (plow drivers, however, continue to serve an important role, communicating their on the road observations to forecasters). Silverton’s forecasters are devoted, full-time, to assessing the avalanche hazard on the passes. Even during long periods between storms, they patrol the passes and analyze the snowpack, its structure, and its stability, allowing them to know approximately how much snow, and at what density, the current snowpack can hold in the event of a storm. When a storm does hit, the forecasters are out on the highway alongside the plow drivers, constantly monitoring conditions and passing recommendations on to the local road supervisor in Durango or Ridgway. Ultimately, it is the road supervisor, not the forecaster, that makes the decision to close the road. The days of waiting for several big slides to come down before deeming the hazard high are over, according to Silverton Avalanche Forecaster Andy Gleason. This has sometimes caused impatience in Silverton, where people still remember the old days and where mail, supplies, and commuter routes are shut down along with the roads. And, of course, when the road is closed it means the precious few winter tourists and their money are kept out, an issue that may even get more urgent when the new ski area opens. Many citizens, especially those that have been around for a while, feel that it is premature to close the roads before any slides have come down. Gleason disagrees. “When I recommend closure I’m always asked: ‘What slides hit the road,” said Gleason. “If we were doing our job really well we would answer that nothing hit the road, but this is what is about to hit the road.” Gleason concedes that, partly because of the importance of the roads to Silverton, the road is usually not closed until smaller “indicator” slides such as the Blue Point have run. Or, he says, if two inches of snow fall in one hour or less in the Uncompahgre Gorge, then it is time to lock the gates with or without indicator slides. “It will avalanche,” said Gleason. The ultimate goal of the avalanche reduction program, according to Gleason, is to create more avalanches of smaller size. “Our perfect avalanche control day would be if every slide ran small to the edge of the road so that there is no clean-up necessary,” said Gleason. Although this policy may mean more frequent and earlier closures, ultimately it could result in cumulative closures of fewer hours during a winter than under the old policy. Most importantly, of course, it means that everyone — the plow drivers, the motorists, the law enforcement people patrolling the roads — are safer. Its first decade of existence has been a successful one for the Avalanche Hazard Reduction Plan. Imel’s was the last avalanche-related fatality on Highway 550, close calls are rare, and during the past five years, long, sustained closures have been kept to a minimum. In 1998-1999 Red Mountain Pass was closed for a total of 110 hours and Molas/Coal Bank for 17 hours; in 1999-2000, the road to the north was only out of service for a total of 33 hours and Molas was closed for a paltry 6.5 hours; and last year, an average snow year, Red Mountain was down for 83 hours and Molas/Coal Bank for 30 hours. These numbers are not small, but in earlier years it was not unheard of for the road to be closed in both directions for 83 hours at one time. Improvements during the last five years have helped the forecasters and controllers immensely. Snow measurement stakes have been placed in the starting zones of the West Lime Creek and Mother Cline slides; Howitzers have returned to their traditional place in avalanche control work, making helicopters less necessary and allowing for more efficiency and quicker control work; and the forecasters learn more about the snowpack each year. Still, the new plan is not perfect. Gleason would like to see more forecasters here (two, Silverton-based forecasters cover Coal Bank, Molas, and Red Mountain Passes in addition to Lizard Head Pass, which is two hours away by CDOT truck); more passive control measures such as snowsheds, snow fences, and snow defense structures; better automated weather stations; and a remote avalanche detection system (one is being researched here but Gleason signed a waiver promising not to talk about it). John Greenell (a.k.a. Greenhalgh) and his trusty pair of snowshoes was one of the mail carriers that provided Silverton a link with the outside world in its earliest winters of existence. He was known as a man that could make the trip up Cunningham Gulch, over Cunningham Pass, into the Rio Grande Country and to Del Norte and back in any type of weather. On Monday, November 27, 1876, Greenell set out from Carr’s Cabin on the other side of the divide on the return trip (over Stony Pass this time) to Silverton. He never arrived. A group of searchers found his body a few days later, frozen to death near the top of Stony Pass, his hand rigidly clutching his mailbag. We have changed a great deal since Greenell’s days, but the mountains are just about the same. Winters are still hard, avalanches still rush down mountainsides, and Silverton is still, occasionally, isolated from the outside world. A heavy duty snow blower punches a hole through the snow that came down the West Riverside slide triggered yesterday, Monday, March 4, on north Red Mountain Pass, US 550. The snow shed which protects the traveling public from natural slide activity is seen in the background. Click on a thumbnail graphic to view a gallery of snowpack data from the NRCS. Colorado statewide basin-filled map March 19, 2019 via the NRCS. Colorado Statewide Basin High/Low graph March 19, 2019 via the NRCS. Arkansas River Basin High/Low graph March 19, 2019 via the NRCS. Gunnison River Basin High/Low graph March 19, 2019 via the NRCS. Laramie and North Platte Basin High/Low graph March 19, 2019 via the NRCS. San Miguel, Dolores, Animas, and San Juan Basin High/Low graph March 19, 2019 via the NRCS. South Platte River Basin High/Low graph March 19, 2019 via the NRCS. Upper Colorado River Basin High/Low graph March 19, 2019 via the NRCS. Upper Rio Grande River Basin High/Low graph March 19, 2019 via the NRCS. Yampa and White Basin High/Low graph March 19, 2019 via the NRCS. From their offices in Lincoln early Thursday, hydrologists with the U.S. Geological Survey were monitoring the final few moments of a stream gauge more than 200 miles away, on the Niobrara River. The gauge had been ripped away by the wall of water released when the 90-year-old Spencer Dam failed under the pressure of the river, swollen with rain and rapid snowmelt and broken ice. But its last readings allowed Lambrecht to measure the size of the surge. And in its wake, three Nebraska counties would learn how that much moving water can become immediately destructive and potentially deadly. How it can cause instant pain and long-term suffering. How it can harm not only those in its path, but those living miles away. First, the wave swept away a section of U.S. 281, a nearby riverside saloon and at least one home, possibly occupied. And it continued downstream, barreling toward the town of Niobrara — and its mouth at the Missouri River — about 40 miles away. The service station owners thought they were ready for the coming water. They’d taken the tire machine and other equipment away. They brought the important paperwork home. They put their ’68 Camaro up on the lift. They moved the rest of what they could to higher ground, filling the rafters with inventory. And the couple had a huge inventory. Vic’s Service has anchored the west edge of Niobrara for 25 years, and had enough hydraulic fittings and plumbing pieces to serve as a kind of farmer’s supply store, said Ruth Janak, who co-owns the station with her husband, Victor. They checked on their business Wednesday, and found it already swamped with 4 feet of water, her desk upturned, pop machines on their sides. A mess, but nothing they couldn’t handle. “We thought, when the water recedes, we’ll be able to get in and clean all that up,” she said. They returned Thursday, and found most of it missing. Later, she would find a jug of hydraulic fluid — and someone else’s pontoon boat — on what remained of the town’s golf course. But their main building, and much of what it contained, had likely tumbled downstream. Theirs wasn’t the only missing building. The wall of water had brutalized Niobrara’s west side, a low-lying commercial district, and the part of town closest to the river. Jody Stark, the chair of the village board, listed the other casualties. Several buildings from a hay business? Gone. A state Department of Transportation garage? Gone. A Knox County road shop? Gone. The Mormon Bridge on Nebraska 12? Stark has video of the deck floating away. The Country Cafe? Still standing, but it had been nearly swallowed by water and ice, with maybe a foot of the roof visible at one point. Still, his town was struggling. The flooding compromised the town’s two wells, leaving its residents without a water supply, and the fire department was going door-to-door, filling containers. Getting in and out of town was also difficult; by Friday, the Standing Bear Bridge to South Dakota had reopened, and there was one passable gravel road south of town. Nebraska 14, the main route south out of Niobrara, was so strewn with ice it was only open for emergency travel. The Spencer Dam was a flow-through hydroelectric dam, with garage-type doors that let water through, and Becker said it wasn’t known whether the doors had been open or closed at the time. They disappeared downstream, he said. Its breach triggered immediate and long-term problems. It swept away a Holt County house just downstream, and authorities were still searching for its owner. And the force of the flow severed the supply of water to the north, in Boyd County. Many of its 2,000 residents relied on the pipeline from Holt County that was buried beneath the river. Now that it’s gone, they don’t have the water they need for drinking, for livestock, for flushing. And Boyd County was struggling to stay connected with the rest of the state. 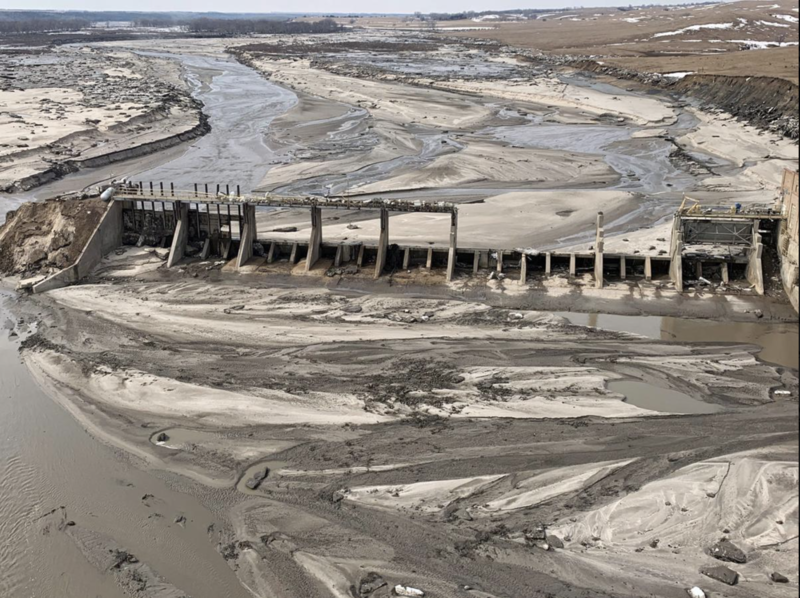 The failure of Spencer Dam took out a pair of routes over the Niobrara River, and the only ways out of Boyd County were north into South Dakota or west into Keya Paha County, Fox said.